Definition at line 23 of file CRDFSubject.h. Definition at line 30 of file CRDFSubject.h. Definition at line 22 of file CRDFSubject.cpp. Definition at line 29 of file CRDFSubject.cpp. Definition at line 36 of file CRDFSubject.cpp. Definition at line 94 of file CRDFSubject.cpp. References mBlankNodeId, mIsLocalResource, mResource, mType, and RESOURCE. Definition at line 91 of file CRDFSubject.cpp. Referenced by CRDFGraph::addTriplet(), CQRDFTreeView::enterProtected(), operator<<(), CRDFNode::setSubject(), and CRDFWriter::write(). Definition at line 82 of file CRDFSubject.cpp. Referenced by CRDFGraph::addTriplet(), CQRDFTreeView::enterProtected(), CRDFGraph::guessGraphRoot(), operator<<(), and CRDFWriter::write(). Definition at line 73 of file CRDFSubject.cpp. Referenced by CRDFGraph::addTriplet(), CQRDFTreeView::enterProtected(), CRDFGraph::guessGraphRoot(), operator<<(), CRDFNode::setSubject(), and CRDFWriter::write(). Definition at line 85 of file CRDFSubject.cpp. Referenced by CRDFGraph::addTriplet(), CRDFGraph::guessGraphRoot(), and setResource(). Definition at line 39 of file CRDFSubject.cpp. References mBlankNodeId, mIsLocalResource, mResource, and mType. Definition at line 51 of file CRDFSubject.cpp. 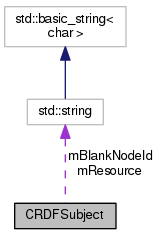 References BLANK_NODE, mBlankNodeId, mIsLocalResource, mResource, mType, and RESOURCE. Definition at line 88 of file CRDFSubject.cpp. Referenced by CRDFNode::setObject(), and CRDFParser::TripleHandler(). Definition at line 76 of file CRDFSubject.cpp. References isLocal(), mIsLocalResource, and mResource. Referenced by CRDFGraph::createAboutNode(), and CRDFParser::TripleHandler(). Definition at line 70 of file CRDFSubject.cpp. Referenced by CRDFGraph::createAboutNode(), CRDFNode::setObject(), and CRDFParser::TripleHandler(). Definition at line 124 of file CRDFSubject.h. Referenced by clearData(), getBlankNodeID(), operator=(), operator==(), and setBlankNodeId(). Stores whether the reources is resolve locally or remotely. Definition at line 119 of file CRDFSubject.h. Referenced by clearData(), isLocal(), operator=(), operator==(), and setResource(). Definition at line 114 of file CRDFSubject.h. Referenced by clearData(), getResource(), operator=(), operator==(), and setResource(). Definition at line 109 of file CRDFSubject.h. Referenced by clearData(), getType(), operator=(), operator==(), and setType().